Birds: How to Attract 'em & How to Deter 'em | Gardens Alive! Q. We just put four birdhouses in our large, terraced vegetable garden and now wonder if that was a good thing to do, as other people are putting up Scarecrows instead. But we're not growing peas or beans, and were hoping that the birds would eat bad bugs off our plants. What do you think? A. I think it's an excellent idea, Bonny! Birds don't typically molest garden crops, and they've certainly never bothered my peas or beans. Crows and similar birds do occasionally pull up the just emerged sprouts of plants like beans and corn (perhaps to get at what's left of the still tasty seed), and you'll sometimes see birds peck at tomatoes, often just to get a drink in dry times. 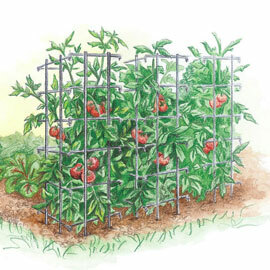 I don't think either event is all that common, and providing a birdbath and caging the plants is all that's generally necessary to protect your tomatoes. Birds ARE, however, notorious pests of some small fruits, especially cherries and blueberries. 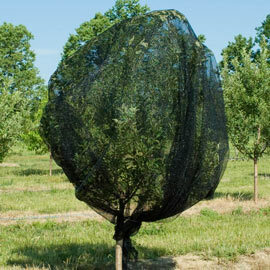 Blueberries are fairly easy to protect with bird netting, but cherry trees get big (that's why they call those motorized high-up platforms "cherry pickers"), and fruit growers often have to go to dramatic (and occasionally operatic) lengths to protect the tasty red fruits. Those exceptions aside, birds are excellent garden allies. In a favorite story published during my time as editor-in-chief of ORGANIC GARDENING magazine, we identified chickadees (and the related titmouse) as the very best, with up to 90% of their diet consisting of insect pests. And their constant activity requires them to eat a lot; a study done in New York orchards in 1920 estimated that one chickadee consumed 1,000 peach pests in a single day! To maximize their numbers, hang suet feeders in the winter and provide year-round nesting boxes packed with wood chips, ideally at the wooded outskirts of your garden. Wrens are the next best, with appetites almost as large and huge families to feed; each pair typically raises a dozen or so baby birds each season. The other top bug-eaters (in order) are swallows, bluebirds, phoebes, true sparrows, vireos, nuthatches, woodpeckers and nighthawks. And maybe nighthawks should move up the list, as they eat some of the toughest garden pests, like Colorado potato beetles, squash bugs, and cuke beetles. In addition to installing nesting boxes that are the correct sizes for these specific hard-working flyers, providing water is essential—especially in areas where it's generally scarce in the summer. Trees and shrubs that produce berries, like junipers, hollies and service berry are also great incentives. Q. I have a nice little garden going, but there is a tree behind it that birds like to sit in, and they're pooping on my greens just when they're ready to eat! What is the best way to clean them for safe eating? A. Oof—I'm not sure that I'd be comfortable eating those greens no matter how they were washed, Jane. Raw manure should never be spread around veggies because of the risk of it splashing onto the food when it rains. In your situation, the raw manure IS the rain! I suggest moving the greens to a different area and/or starting a new batch somewhere else. (If space is limited, use containers; I grow all my lettuces in big pots for ease of harvest.) Then grow flowers in that poopy spot. Or trim off a few limbs so that the bombers aren't directly overhead of that bed. Or rig up some sort of apparatus to catch the poop on its way down—like a basket filled with straw. Then you can mix the well-manured straw into your compost pile and turn a current problem into a future solution! Q. I have a problem with birds using my front sidewalk as their bathroom. Please tell me what I can do to prevent this. I'll be hosting a large party later this summer and need to take action fast! A. If the birds are sitting on a tree limb that's overhanging the walkway, plan to remove the offending limb this winter. (Don't prune healthy wood now or in the fall; it would stress the tree.) If they're sitting on an air conditioner or some other structure that's overhanging the walkway, see if you can screen them out the way they keep pigeons out of the nooks and crannies of public buildings. For now, try and scare them off. Farmers rely on inflatable 'scare eye balloons' for this. Kind of like a beach ball with a big eye painted on each side, they seem ludicrous but are surprisingly effective. You could also try a fake owl and/or a rubber snake. But the most effective bird deterrent is probably a product called "Bird Scare Flash Tape." It's a silvery/Mylar kind of material sold in rolls like masking tape. The slightest breeze causes it to wave around wildly and give off a variety of sounds—whips, crackles, whistles—that birds just can't seem to get used to. It also reflects light in lots of different ways for even more 'startle factor'. It gets rave reviews from farmers and gardeners—and folks like you, who just want to sit out on their stoop like a decent human being! Oh, and in your case, it'll also look like you just hung some party streamers to welcome your guests. The rubber snake might not go over as well.